Recent pickup from DungeonStone.com, nice and fairly durable. This was a basement under a house the group investigated–the Bard has this thing for staying clean—yeah it was funny—blood trail! 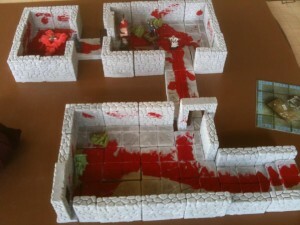 Notice the silly string that dried in one room, blood and guts—all in all made for a nice necromancers hideout. This entry was posted in Links and Posts and tagged dnd props, dungeonstone.com. Bookmark the permalink.